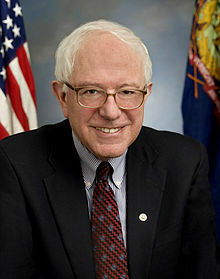 The first regular presidential primary was held in New Hampshire (Iowa has a different system, called caucuses) resulted in solid victories for Democrat Bernie Sanders and Republican Donald Trump. MANCHESTER, N.H.—Democratic socialist Bernie Sanders and outspoken billionaire Donald Trump have won their respective New Hampshire primary contests, securing their first U.S. presidential primary election victories. With 89 percent of polling places reporting, Sanders had 60 percent of the Democratic vote compared to 38 percent for former Secretary of State Hillary Clinton. Trump had a similar margin for the Republicans as he grabbed 35 percent to win among a much more crowded field. Well, people are frustrated with the status quo. On the Republican side, those voters dislike the status quo, in this instance meaning the Obama Administration, that they really want change. About 1/2 of their voters tend to believe that outsiders are the answer (Donald Trump, Ted Cruz, Ben Carson, and Carly Fiorina are all considered to be outsiders). The other 1/2 of Republicans want change as well, but tend to feel that more establishment accepted candidates are more likely to win in November as well as to more effectively govern (John Kasich, Jeb Bush, Chris Christi, and Marco Rubio are all considered to be establishment candidates). Of course, we could still see a battle in November between Hillary Clinton and one of the establishment Republicans. Stranger things have happened. Speaking of strange things, someone sent me a link to an NPR article laying out five similarities between Donald Trump and Bernie Sanders. Perhaps I should add here that one report I read said that Donald Trump is the second choice for many of Bernie Sander’s supporters. I watched some of their speeches last night. The avowed socialist Bernie Sanders did a shred job of turning that victory into a national fund raiser, while vowing to take from those he feels should not have what they do and to give their wealth to others he feels should have it. People are turning to ‘outsiders’ because they recognize that something is terribly wrong with the direction of the USA. Yet, the answer is not Donald Trump nor Bernie Sanders. The answer is national repentance, which is something neither of those candidates has spoken about. We are seeing many running for office that do not have godly character. And God will take steps to put in office whosoever He feels should lead the USA. The way the Republican votes in Iowa and New Hampshire have gone specifically suggest that to me already. Now let’s briefly consider the two New Hampshire winners individually. U.S. Republican presidential contender Donald Trump said German Chancellor Angela Merkel was wrong to let in thousands of migrants into Germany and that the refugee crisis could trigger revolutions and even the end of Europe. The 69-year-old property magnate also said Brussels had become a breeding ground for terrorists and some neighborhoods in Paris and elsewhere in France had become no-go zones. Donald Trump has now made statements that many Europeans will not like. Donald Trump, should he become President of the USA, is likely to greatly offend the Europeans. And while many in the USA do not care about that, the Europeans do. And according to Bible prophecy, the Europeans will DEFEAT THE USA MILITARILY (Daniel 11:39). Those who believe that Bernie Sanders or Donald Trump can save the USA are misleading themselves and overlooking a lot of what the Bible teaches. The USA needs national repentance and the Kingdom of God. This entry was posted on Wednesday, February 10th, 2016 at 8:00 am	and is filed under Prophecy.